A Questionable Shape, by Bennett Sims. Columbus, Ohio: Two Dollar Radio. 242 pages. $16.50, paper. 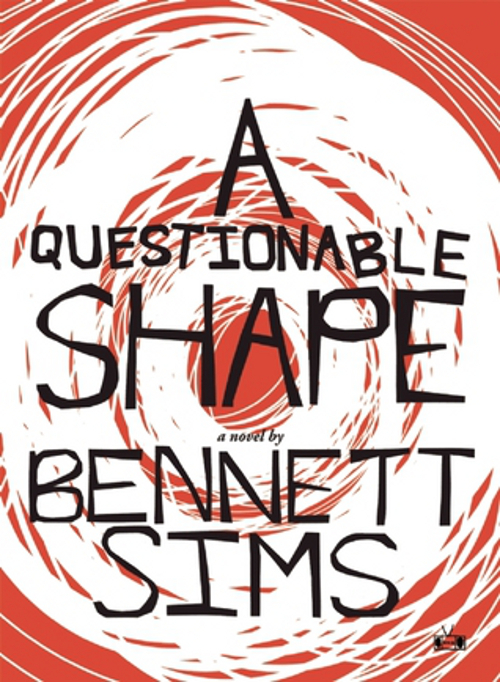 Bennett Sims’ debut novel, A Questionable Shape, is a cornucopia of postmodern stimulation. A “zombie novel” that utilizes footnotes to reference Freud, David Chalmers, Goldeneye (the video game), Heidegger, Oedipus Rex, Nietzsche, Joyce’s “The Dead” (or, as Sims’ narrator muses, “The Undead”) Solaris (both the Tarkovsky original and the Soderbergh remake), and Hurricane Katrina, among other “high culture” and “low culture” benchmarks, A Questionable Shape explores, with an unparalleled philosophical rigor, the recent inundation of zombie narratives to infect (yeah, I know) our recent cultural landscape. Where most zombie narratives pile on the gore and the sheer overwhelming number of monsters—plus the outside threat of humankind unleashed from its shackles of social mores and governed law—to create its horror, Sims’ novel revels in the more mental horror of the uncanny and the emotional horror of loss. (1) It establishes the main plot and conflict, which is that the novel’s narrator, Michael Vermaelen, is helping his friend Matthew Mazoch search for Mazoch’s undead father in all their old haunts, while Vermaelen’s girlfriend Rachel suspects Mazoch’s motives (will he kill his father as a form of euthanasia, or will he do the right thing—in both a moral and legal sense—and turn his father over to the CDC?) and questions Vermaelen’s involvement, which in turn strains their relationship. (2) It establishes a theme of the uncanny as a “feature of the unintentional return,” as quoted from the novel’s Freudian epigraph—that is, undead humans returning, for both conscious, unconscious, and subconscious reasons (here is where the threat of the unfamiliar surfaces from beneath the facade of the familiar), to their most beloved places. (3) It establishes a theme of loss, of the dead wanting to return home while never really being able to return home, because even if they get there, who’s to say they know why they’re there or what they’re searching for in the first place? (4) It establishes the tone of the novel (and the narrator’s voice) as a philosophical hypothesis to be defended or refuted, as everything that follows in the novel’s dense philosophical examination of self and un-self stems from this central if/then concept. (5) As a point of contention, it calls back to another zombie masterpiece: George Romero’s Dawn of the Dead, in which the undead flock to the movie’s main setting, a shopping mall. When asked why the zombies are all returning to the mall, the movie’s main character replies: “Some kind of instinct. Memory of what they used to do. This was an important place in their lives.” Yet, while the movie’s noted for its satirical take on late-1970s American consumerism, Bennett’s take on this conceit elevates it from a joke to a full-blown investigation of our pathological obsession with familiarity. Undeath is therefore established in A Questionable Shape as an intellectual exercise, not merely an excuse for gory special effects and cheap (if still satisfying) jump-out thrills. That’s not to say that A Questionable Shape cannot be spooky and tense, such as in the moments when Mazoch is rooting through his father’s abandoned house, leaving Vermaelen in the still-running car alone. That’s only to say that its main method of fear-inducement is the more intimate nature of Freud’s uncanny: the idea of familiarity turning against us. The undead’s uncanny nature is their most potent weapon: their familiar appearance attracts their loved ones, who will undoubtedly fall prey to their familiarity if inadequately prepared. One of the novel’s most touching and troubling scenes is when Vermaelen and Rachel are practicing “defamiliarization exercises” provided by the CDC’s anti-undead guide, FIGHT THE BITE, out of fear that if either one of them was infected, the other wouldn’t be able to resist their loving, familiar faces. FIGHT THE BITE, therefore, is not supposed to help the survivors combat the undead themselves, but their uncanny nature. Even Sims’ use of “undead” over “zombie” enhances the novel’s uncanny threat by creating not a new species (“zombie”) but a deviation on our own, reversing the sanctity and comfort of death’s finality. Directly contrary to most zombie narratives, however, is that the world of A Questionable Shape seems at times eerily utopian. Of course there are the tried-and-true signifiers for an apocalyptic zombie outbreak: the abandoned malls and movie theaters, the empty homes, the zombie horde (though in less numbers). But there is also a strange sense of peace brought on by the undead outbreak: the outbreak itself is pretty well contained, people are safe enough to walk around outside and have picnics, the empty shell of American consumerism has been exposed and hollowed out, etc. There are even idyllic scenes of the undead stalking in stoic groups in the early morning fog. But there is always the threat of another outbreak, another natural disaster that will free the temporarily contained undead to wreak havoc yet again, that casts the novel’s gloomy uncertainty and paranoia which underlies Vermaelen’s entertaining (for him and for us) mental gymnastics. And there is still the duplicitous nature of the undead with which to contend. What is the legal status of the undead? Are they still human, or something else? Should the be protected or put down? All of this is to ask: What makes us so different from the undead? Do we not haunt our own familiar territories? Do we not try to infect others with what we believe? And do we not wish that our beloved dead would return to us? All of these questions stem from the novel’s main conceit, which is interestingly never truly confirmed by the novel’s narrative. By not answering these concerns, A Questionable Shape beautifully implicates our own undead-ness, our own contemporary obsession with slaughtering of hundreds of thousands of monsters that look just like us. A Questionable Shape at Amazon.com. A Questionable Shape at Powell’s City of Books. A Questionable Shape at Two Dollar Radio. Michael Goroff lives in Columbus, Ohio. His reviews and interviews have appeared in or are forthcoming from The Southeast Review, Whiskey Island, and Barn Owl Review.